Pictured: Stained glass by Stanley Tomlin. For those of you who remember attending the chapel at the Irish Glass Bottle premises on Ringsend Road, you may recall some fine craftsmanship in stained glass art. Now that the chapel is no longer there, NewsFour set out to shed some light on the whereabouts of these kaleidoscopic artefacts. 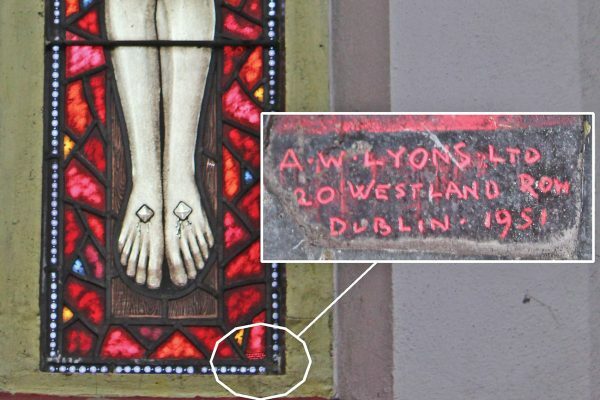 The stained glass at the chapel at the Ringsend Road plant was made by Stanley Tomlin, when he was employed by A.W Lyons, who were stained glass manufacturers based at 29 Westland Row, Dublin 2 in the 1940s. It had a cruciform stained glass and two side windows, each with the christogram xp-his-id. When the chapel was demolished, Stanley’s son Alan Tomlin, who took over the Irish Stained Glass company from his late father and mother Diana, and now runs Irish Stained Glass (ISG) with his wife Barbara, rescued the pieces. One of these side windows is sitting on Tomlin’s bench in the workshop in Sandyford, and the other is in the chapel at the Royal Victoria Eye and Ear Hospital on Adelaide Road. The cruciform, according to Tomlin, was badly damaged and is not in his possession and was sold off privately to a Birmingham collector. 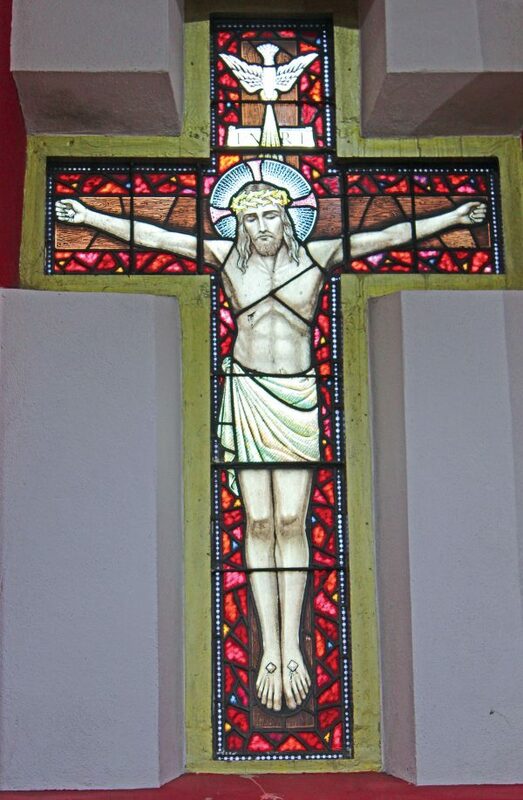 However, Stanley Tomlin made a duplicate and this cruciform is placed in timber behind the altar at the church at Kilbrittain, Co Cork under the care of Fr. Jerry Cremin. Above: Stained glass photos by Father Jerry Cremin. Closer to home, at St. Patrick’s Church, a new stained glass piece is now in place for all to see. The piece, John the Baptist, made by the Early Studios, dating back to the 1930s was previously placed in the back office but it was decided it should be shared with the public and William Malone and his crew at Abbey Stained Glass, based in Kilmainham, performed the delicate work of separating each part and piecing it all back together again. They also restored and re-leaded the St. Patrick stained glass made by the Harry Clarke Studio, where Stanley Tomlin was also employed, and this sits on the knave to the right as you enter the church.